Did you know that you could tour more than 60 graduate programs or earn 15 different graduate degrees right here at City College? Between November 8th and November 15th, we invite CCNY undergraduate students to explore new horizons. 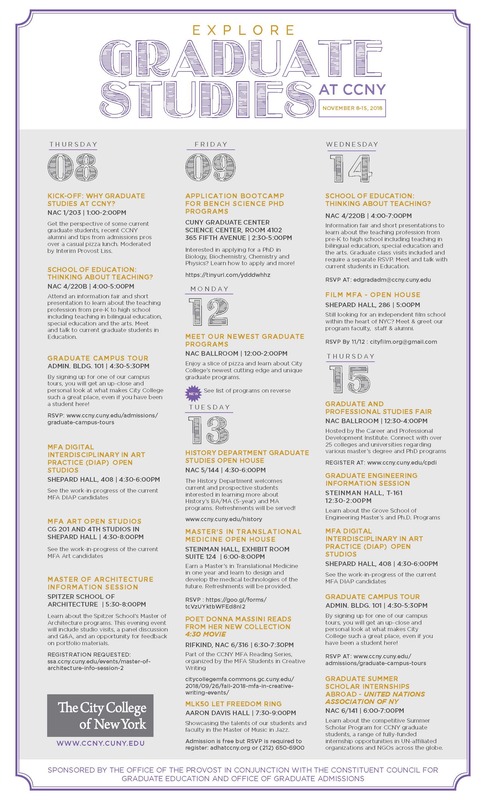 Visit open houses, open classes and open studios. Sample events hosted by and featuring our graduate students and faculty. 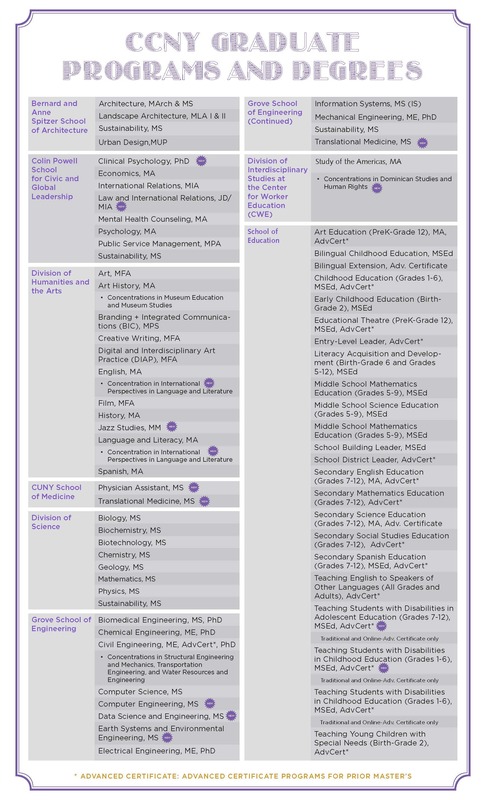 KICK-OFF: WHY GRADUATE STUDIES AT CCNY? Get the perspective of some current graduate students, recent CCNY alumni and tips from admissions pros over a casual pizza lunch. Moderated by Interim Provost Liss. SCHOOL OF EDUCATION: THINKING ABOUT TEACHING? Attend an information fair and short presentation to learn about the teaching profession from pre-K to high school including teaching in bilingual education, special education and the arts. Meet and talk to current graduate students in Education. By signing up for one of our campus tours, you will get an up-close and personal look at what makes City College such a great place, even if you have been a student here! Learn about the Spitzer School’s Master of Architecture programs. This evening event will include studio visits, a panel discussion and Q&A, and an opportunity for feedback on portfolio materials. Interested in applying for a PhD in Biology, Biochemistry, Chemistry and Physics? Learn how to apply and more! Enjoy a slice of pizza and learn about City College’s newest cutting edge and unique graduate programs. The History Department welcomes current and prospective students interested in learning more about History’s BA/MA (5- year) and MA programs. Refreshments will be served! Earn a Master’s in Translational Medicine in one year and learn to design and develop the medical technologies of the future. Refreshments will be provided. Part of the CCNY MFA Reading Series, organized by the MFA Students in Creative Writing. Showcasing the talents of our students and faculty in the Master of Music in Jazz. Information fair and short presentations to learn about the teaching profession from pre-K to high school including teaching in bilingual education, special education and the arts. Graduate class visits included and require a separate RSVP. Meet and talk with current students in Education. Still looking for an independent film school within the heart of NYC? Meet & greet our program faculty, staff & alumni. Learn about the competitive Summer Scholar Program for CCNY graduate students, a range of fully-funded internship opportunities in UN- affiliated organizations and NGOs across the globe.